The last week in which some random prose has to be written to cover a team that hasn’t played in ages. They’ll be itching to play with so much time off, with the Cats their first opponent in a two game streak. Unless we see a shock result, we don’t expect to see a change in this power ranking until the final game of the season. Another high scoring shut out victory for the Warriors. With comparable scores, the score could have been in the 80's (given the Warriors beat the Cats by 50+, and the Cats beat the Saxons by 28), but we saw a little lower score. Judging by the score breakdown, with the majority of points coming in the 1st half, it might be reasonable to assume the Warriors put their backups in early to improve their depth. The Warriors role on to another week in the second game of a three game stretch against Berkshire. The O’s may be 0-1, but any other team (with the exception of possibly the Blitz), if they had only played 1 game against the Warriors would also be 0-1. If the rankings were based on record, this would just be a league table. The Aztecs now have to fight for a playoff place the remainder of their season. Getting the two ‘hardest’ games out of the way can be a blessing and a curse. Injuries sustained have the whole season to heal, and learning from those games can be implemented. When facing some of the lower ranked opponents it will be important to get backups in for game time in the lead up to the playoffs, as depth is key for a deep playoff run. The Cats face off against the Blitz this weekend, and will need to put in a good show if they hope to retain their #5 spot in the rankings this week. Given the amount of time to prepare for the game, there is no doubt they will be prepared, and they aren't going in blind having already faced the Warriors. Time to see what the Cats are made of, and see if they can raise eyebrows for a playoff place this year! 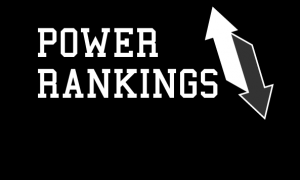 With 8 of our 11 teams in action this weekend the power rankings next week have the potential to look very different. The Mavericks have possibly the biggest chance at altering the rankings the most. They might feel a little hard done by, a 2-0 team ranked 3 places lower than an 0-1 team, and hats will be eaten if they can pull off the shock win on Sunday! Sussex climbs another place this week after a shutout win against the admittedly low ranked Warriors. Sussex are almost the opposite to the Aztecs with playing the two lowest ranked teams in their first games, now the two teams clash this weekend, and the true premiership strength of the Thunder will be probed. Berkshire didn't play this weekend, but thanks to the Thunder getting a decisive win against South Wales, they drop down a place. The likelihood of reclaiming the place this weekend is a murky one given the opposition of the Warriors who have been taking no prisoners in their previous encounters, again another potential for a massive upset. With Chris “Mac Daddy” Kelly from Kris Kross passing away earlier this month, we saw that the Saxons QB was trying to audition for the place in the duo with his backward helmet stunt that has had some wide activity in the past couple of days. A reasonably respectable points conceded against the Warriors of 47 is something the Saxons can take away from the battle. Another loss for the SWW and this season is starting to look a little bleak. Some of the bright spots for the Warriors was a seemingly impressive run game against the Thunder, with multiple long runs. This is something they will be working on this week during a bye-week before the Warrior-bowl which takes place in South Wales next week. Three out of the bottom four teams in the power rankings have the Warriors as their next opponents, we envision that the rankings at the bottom aren’t liable to change much in the coming weeks without a BIG upset. Here’s to hoping. EFAF European Championships 2014 in Austria.